Lanzarote located just off the west coast of North Africa is famed for its pleasant subtropcial climate, low humidity, cooling trade winds, crystal clear balmy waters and stark volcanic landscapes. Being only a 4 hour flight from most European cities it’s an ideal place to kick back, relax and learn how to windsurf or hone your skills. 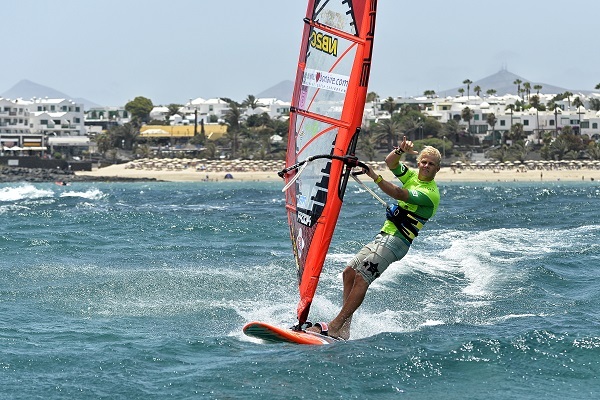 Zoco Travel has teamed up with Lanzarote’s best VDWS accredited Windsurfing Center to bring you the best windsurfing holidays available in Lanzarote. 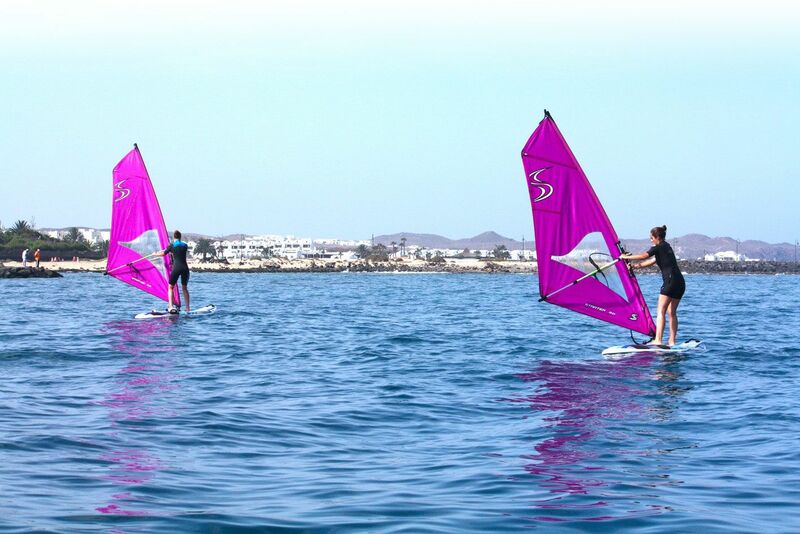 The windsurfing Academy is located right on the beach at Las Cucharas in Costa Teguise and offers good conditions for professionals and beginners alike. In the sheltered bay beginners and less experienced sailors have a great time learning or improving their windsurfing skills, while out in the bay the wind and waves challenge even the most experienced windsurfers. 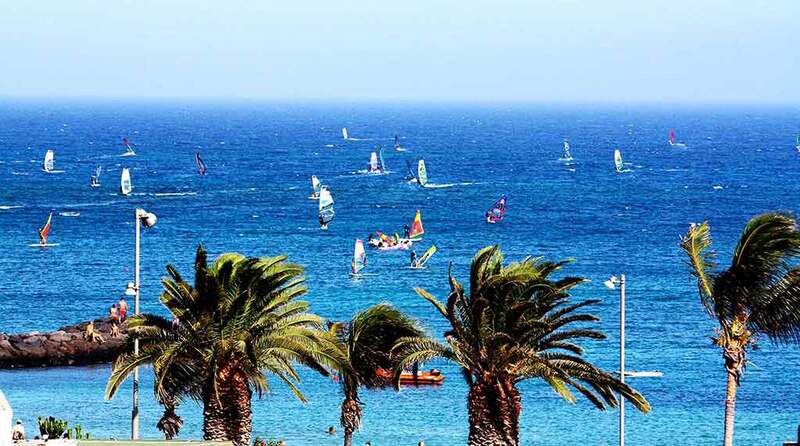 The base for our self catering windsurfing holidays is the modern resort and bay of Costa Teguise, home to the annual PWA professional windsurfing championships. Everybody is welcome from absolute beginners who want to learn to windsurf, to Intermediates who have completed a windsurf course elsewhere and need to improve at one of our windsurf clinics, to experienced windsurfers who want to rent windsurf equipment and stay in accommodation within easy walking distance of the windsurf beach and spot. 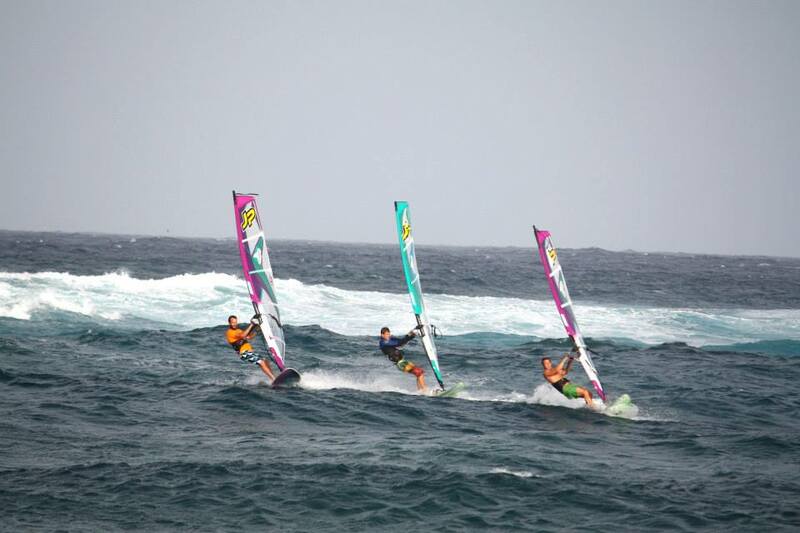 Learn to windsurf in a safe and fun environment. The courses are designed to help you become a self sufficient and knowledgeable windsurfer. These clinics cover everything from water starting to Jumps. VDWS approved courses designed to suit your developing skills/needs. Equipment Rental + accommodation holidays for Intermediate & Advanced windsurfers. Great apartments, excellent equipment by JP and good advice, what more do you need? Put together your own windsurfing holiday in Lanzarote. We can provide you with accommodation, car hire, tuition, equipment rental & all the info. you need for your trip. From as early as March to mid to late September the trade winds “Los Alisios” start to blow from the North East and the winter groundswells die off providing a variety of windsurfing conidtions ideal for beginners and windsurfers looking to progress. For the rest of the year the island still has good wind statistics and there are plenty of waveriding conditions for more advanced riders. Las Cucharas beach got its first international reputation from holding the Windsurf Worldcup in the early 90’s and is probably the best known windsurfing spot on Lanzarote. The wind is moderate near the shore but as you get out into the bay it blows harder. Because of the flat water conditions and strong, steady winds further out, this is the ideal spot for freestylers. If you’re more of a wave rider, the northern and easterly parts of the bay are great on the rising tide and provide some good swell. About 300 meters out from the point there’s a wave break that can get pretty big on the right conditions. WHO WILL IT APPEAL TO? The pleasant all year round climate, balmy water temperatures, spectacular unspoilt windsurfing locations, good wind statistics, progressive and challenging windsurfing conditions plus short flight times from most European cities combine to make Lanzarote a suitable destination for all levels of windsurfers throughout the year. Costa teguise is a great base for families and people looking for a resort-based holiday where the beach, the courses, the shops and nightlife are all within walking distance of your accommodation. The ‘Lanzarote windsurfing Experience’ has it’s base in Costa Teguise. Costa Teguise developed around three white sandy beaches that today make up the resort. The largest of these is Las Cucharas and this beach lies at the centre of the resort and is where all the windsurfing lessons take place. The other two beaches, also worth checking out, are Los Charcos and El Jablillo. Costa Teguise could never really be ever described as wild, but it’s certainly quite lively which is why it’s popular with families and single travellers looking to meet other people and enjoy the nightlife. Lanzarote has a small population of local windsurfers, the vibe is good and crowding is not yet an issue. 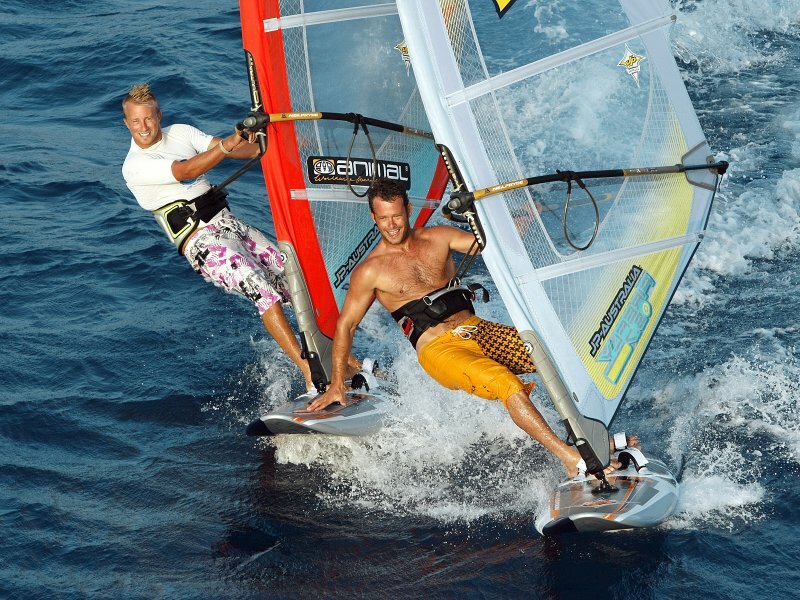 The windsurfing Center was founded in 1987, is a recognised VDWS center and has been successfully running windsurfing courses for people of all ages from all over the world. This is a local school run by locals and is well respected as one of the best training grounds in europe. The academy has an experienced team of windsurfing instructors who are accustomed to coaching at different levels and they live to windsurf and enjoy nothing more than to introduce people to windsurfing. The instructors use a combination of local knowledge and proven techniques developed by the VDWS. All windsurfing instructors are VDWS qualified and the center has a wide range of windsurfing equipment from leading windsurfing brands and water rescue vehicles at it’s displosal.